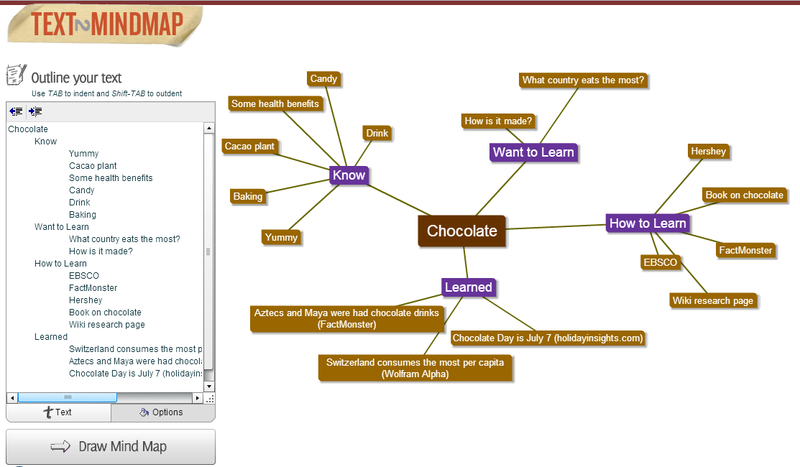 Text2MindMap is a simple outline-to-visualization tool. It is free to use, displays no advertising, and does not require a login. How simple is it? Type text in the box, tap the tab key to delineate outline levels, click Draw Mind Map and see a visualization of your ideas. The beauty of this tool is that students will spend more time grappling with ideas than they will learning the technology. The screen shot on the right shows the beginnings of research on chocolate (click to enlarge). A drawn mind map can be customized. Each level, branch and box can be moved, helpful since some boxes tend to overlap. Other customization options: font size and color; box color (by level and branch); line color, width and style. Completed visualizations can be downloaded as a PDF or PNG (image). Students can then email you a copy of their visualization as an attachment. 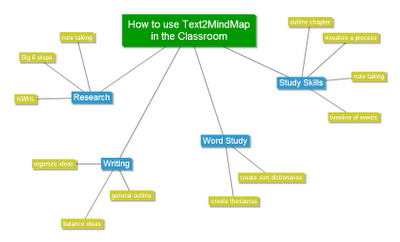 The outline and visualization can also be saved on Text2MinMap's server (email address required). Once saved you are provided two links: one leads to an editable page, the other to a read only version. Share the link to the editable page to invite group brainstorming (as an example, you are invited to brainstorm uses for this tool). You (or your students) can also share a read only link so viewers can see both the outline and visualization.